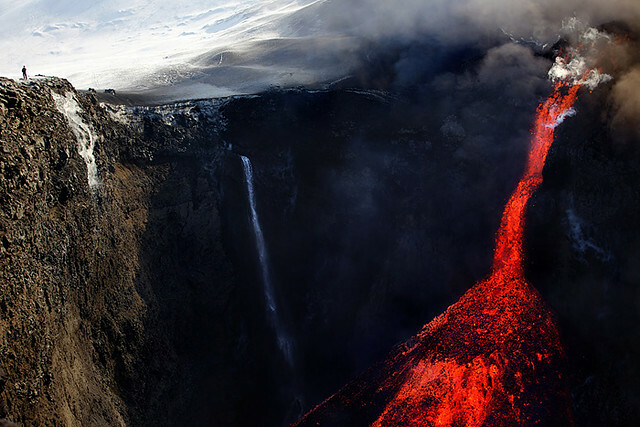 On 20 March 2010, after months of heightened seismic activity, a volcanic eruption on the Fimmvörðuháls Pass opened a 500-metre fissure in the Southern Highlands of Iceland. 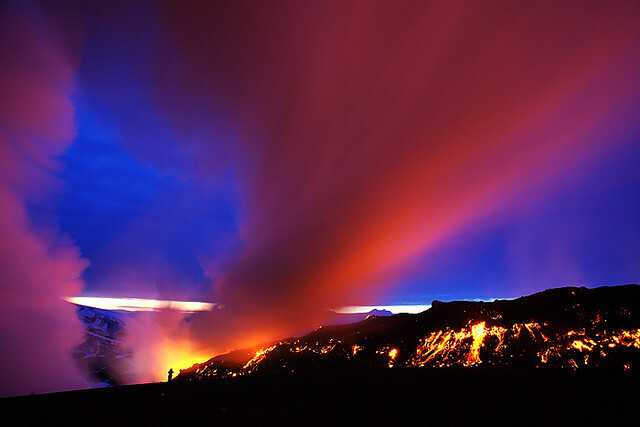 This event marked the beginning of a series of volcanic eruptions in the region, the most famous of which would be that of Eyjafjallajökull glacier volcano, whose giant ash plume brought European air traffic to its knees. To mark the nine year anniversary of the Fimmvörðuháls eruption, we’d like to share some amazing photos and video footage that was captured over the 3-week long period of volcanic activity. Fimmvörðuháls Pass is the stretch of Highlands that runs between Eyjafjallajökull and the glacier, Mýrdalsjökull which sits atop another infamous volcano, Katla. Despite its proximity to these volcanic titans, Fimmvörðuháls is still one of Iceland’s most popular hiking trails. Back in 2010, however, it was strictly a no man’s land, inviting only to the most intrepid seismologists and volcanologists. There had been a group of hikers not too far away from the epicentre, but they were swiftly retrieved from the danger zone by helicopters. The South of Iceland is home to a number of large active volcanoes, many of which are capped by glaciers, carrying the added threat of glacial flooding in the case of an eruption. Iceland’s Department of Civil Protection and Emergency Management monitor the area intensely and have contingency plans for every scenario. On the 4th of March proceeding the Fimmuvörðuháls eruption, the Civil Defense had already mobilised a first level contingency plan in the area. There were no casualties. About a week following the original eruption and subsequent fissure, a further crevice opened creating two new craters which would later come to be named Móði and Magni, after the sons of the thunder god, Thor. The first announcement of the eruption came about at 23:58 on the 20 March and by the 22nd, the plume of smoke rising from the lava flow measured approximately 8-kilometres into the air. The lava flow eventually created a ‘lava-falls’ cascading an incredible 200-metres into a gorge near the fissure, making it the highest such phenomena in the world. The Fimmvörðuháls eruption lasted until April the 13th and did not have the same catastrophic consequences as the Eyfjallajökull eruption, which subsequently began the next day, on April 14th. Nowadays, the region is once again serenely beautiful and open to visitors. You can explore the Fimmvörðuháls Pass and the legacy of the 2010 eruptions on this day tour. A Super Jeep will transport you to the Highlands where you hike to see the craters Móði and Magni as well as enjoying stunning panoramic views of the interior and entire South Coast. If you’d prefer a more intensive exploration of the area, you could take this three-day hiking tour beginning in the Valley of Thor, Þórsmörk, crossing freshly formed 2010 lava field, Goðahraun, and following the Skógá river to your final destination, Skógafoss waterfall. Did you find this article interesting? Were you affected by the 2010 eruptions? Let us know in the comments. 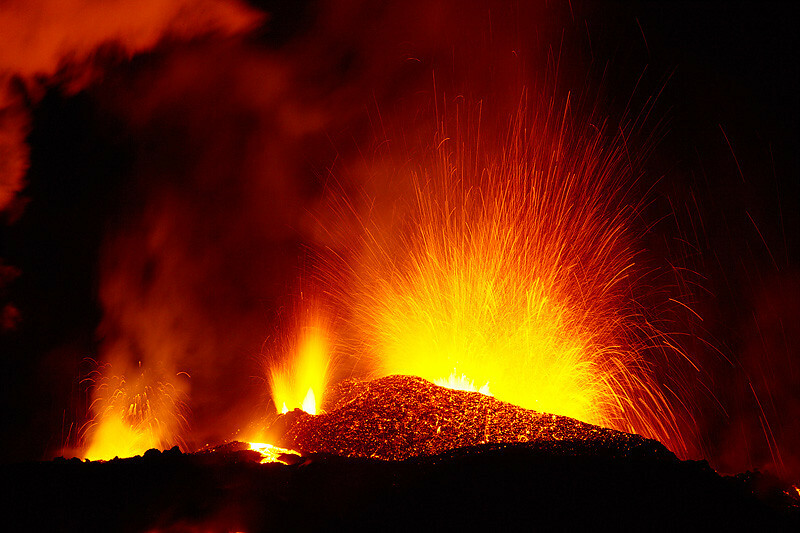 If you’d like to explore Iceland’s volcanism for yourself, book a Volcano Tour here! Read about a local’s experience of hiking the Fimmvörðuháls Pass, here.